Dhaka, Dec 8 (Just News): Sri Lankan players wore face masks to combat severe pollution during the smog-shrouded five-day game, which saw fast bowlers Suranga Lakmal and Mohammed Shami vomiting on the ground, apparently after inhaling the noxious air. Doctors slammed cricket authorities for putting players' health at risk, and although play was halted for about 20 minutes on day two, the game resumed. The fiasco could prove to be a death knell for Delhi as a Test venue at least during winter, when the capital's air pollution is at its worst. Man of the series Virat Kohli plundered runs and records in all three matches. 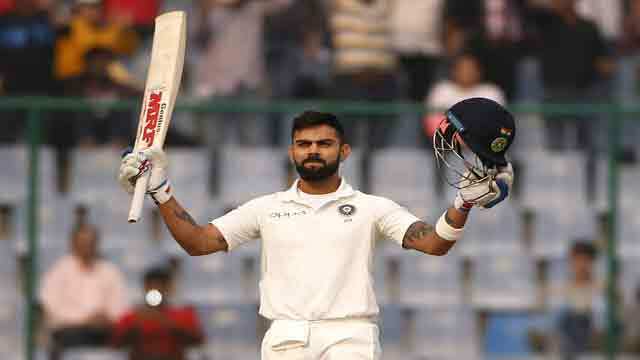 Nicknamed King Kohli, the prolific batsman is in the form of his life, hitting two double centuries in the series including a career-best 243 in Delhi. He became the first player to score six Test double tons as captain, surpassing West Indies great Brian Lara. Accumulating 610 runs in three matches at an average of 152.50, Kohli said "self-belief" had been key to his success. "It was a kind of a revelation that I can play in Tests the way I can do in ODIs... if you can believe in yourself, you can achieve anything in any format," he said. India appear well-equipped to chase a record 10th successive Test series triumph during their South Africa tour starting January -- particularly given the strong form of their fast bowlers. While spinners Ravichandran Ashwin and Ravindra Jadeja topped the bowling charts in the Sri Lanka series, pacemen Mohammed Shami and Ishant Sharma were lauded for their performances on a lifeless Delhi pitch. Earlier Bhuvneshwar Kumar claimed eight wickets in the opener in Kolkata. "Shami and Ishant's (bowling) rhythm was excellent and they were a revelation," said India's bowling coach Bharat Arun. A selection drama back home even while the Delhi Test was still in progress highlighted the chaos gripping Sri Lankan cricket. The island's sports minister stopped nine cricketers from flying out to India to take part in the upcoming one-day series -- Dayasiri Jayasekera, who once called the Sri Lankan players fat following failed fitness tests, was apparently unhappy with the choice of the team. Thisara Perera's side was finally cleared to travel. Test skipper Dinesh Chandimal rounded off his series with a century in Delhi -- but immediately learned he will play no part in the one-day matches. Chandimal himself put on a brave face, saying: "I got enough matches in ODIs against Pakistan and I didn't perform well ... This period (outside the team) I will use to become a good ODI player." But for many others the omission simply proved he is the latest victim of whimsical changes intended to rejuvenate the team's dipping limited-overs fortunes.